Demre is on the coast of the Teke peninsula, west of the bay of Antalya, with the Taurus Mountains behind. The mountains are forested and the coastal strip is made of good soil brought down by the mountain rivers. The climate is the typical Mediterranean pattern of hot dry summers and warm wet winters. Before the tourism boom began in the 1980s the local economy depended on agriculture, which is still important today. The villages of Demre grow pomegranates and citrus fruits and now a large quantity of fruits and vegetables all year round in glass houses. Also with its rich history, attractions like the island of Kekova, the sea and warm weather this coast is very popular with holidaymakers from Turkey and all over Europe, although Demre still does not have the high volume of tourists enjoyed by districts nearer Antalya airport. Some local handicrafts like rug making, and events such as the annual camel-wrestling festival bring in extra income. The local cuisine predictably includes fish and seafood from the Mediterranean. 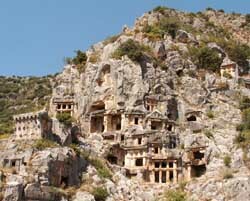 Myra was one of the most important cities in antique Lycia. Coins have been found dating back to 300 BC but logically the city must have been founded centuries earlier. The city thrived as part of the Roman Empire and many public buildings were constructed. The earliest church of St. Nicholas at Myra was built in the 6th century. The present-day church was constructed mainly from the 8th century onward a monastery was added in the second half of the 11th century. This entry was posted in Antalya on 28 September 2018 by karagozcu.